In all my ultras to date, I've entered with a plan to run my own race. I'll figure out various aid station splits to meet my goal time, and then I simply put my head down and try to make it happen. For the Red Hot, I took on a very different approach. No splits and no conservative start. My goal was to crack five hours after running a 5:16 last year and knowing I could do a little better. I knew that shaving off 17 minutes would require a "racing" type effort from the start and that's not typically how I roll out there. Shortly before the race, I decided that in order to make it happen, I'd go to school. My teachers would be Todd Gangelhoff and Joe Ziegenfuss. Both of these guys have thrown down some impressive times at many races. Todd went sub-5 last year, so my plan was to chase them and observe how they ran. The morning was chilly as the sun rose into bright blue skies. After a quick pre-race meeting we were off into the spectacular canyons and mesas. It was quite convenient for me that Joe and Todd began running together, so I hung back as school was in session. A few miles in, Joe pulled over for a bathroom break and Todd and I just kept trucking along. The meeting - Pink ribbon is Good. Blue ribbon is bad. 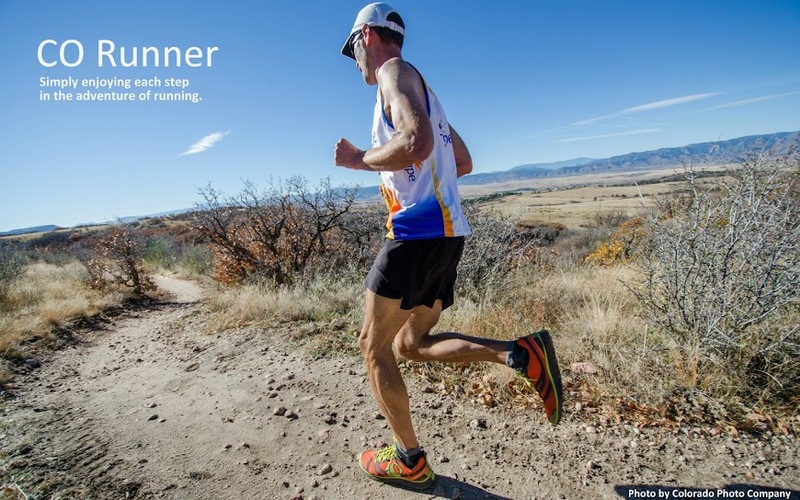 If you've ever run with Todd, you would know what a strong uphill runner he is. There's a decent amount of climb in the first 10 miles of the race and Todd's pace was hot. We were easily clicking off some miles in the low 7's. I'd be lying if I said I wasn't concerned about a major blowup later on. Who was I trying to kid? I've only run that pace in a road marathon. Around mile 14, we hit a long flat stretch and Todd and another dude started pulling away as I just couldn't keep that pace going any longer. I came into aid station #3 and one of the volunteers said I was 15 minutes behind the leader. I laughed since no one has ever provided me that information in a race before. My response? "Thanks, but that time is only going grow!" At mile 18.5, I pulled over for a bathroom break and lo and behold, Joe comes flying along. I quickly hopped back on the trail and we chatted for a bit. Apparently Joe had been about 300 yds behind me for the last 15 miles. What followed was Joe and I leapfrogging a bit and helping each other stay on course during the slickrock section. He was typically in front of me and at times started to pull away. It was around now the pain "tennis match" began. My knee began the "bandera ache", and my left hip was giving me a sharp stinging sensation. The hip thing began about a week before the race, but I figured it would eventually run it's course. The knee and hip nicely alternated in delivering their pain. While the pain was real, it was nothing compared to the sting of a DNF, which was still fresh in my mind from Bandera. The only pic captured on course. Joe about 300 yds ahead. After passing through the mile 28 aid station, we were running next to each other and agreed that breaking 5 hours was not going to happen. I was discouraged, but tried to hold it together enough to stay under 5:16. Joe slowed down to run next to me, but I told him to go on ahead. My breathing was a bit off, so I really couldn't talk. It didn't take much and he move ahead by a quarter mile or more. With about a mile to go, I started to recognize the final stretch and looked at my watch. 4:43. I'm not sure what we were thinking when we thought we wouldn't make it under 5 hrs. That really got the juices flowing and I started pushing it hard on the downhill stretch. Joe had built up quite a gap, but I was able to cut some of it and cross the finish line about 10 seconds after him. 4:50. 13th place! So happy to be done! One of my top three favorite finish line scenes awaited. This race was by far the hardest I've pushed it in an ultra. I can't thank Todd & Joe enough for being the carrot that kept me going. I know I would have walked more in the second half if Joe wasn't up ahead running. I carried my camera and it would have been a perfect day to capture some shots of the course, but when you're chasing some seriously fast guys, taking the camera out is not an option. I did once towards the end, but that was so I could not kick myself for carrying it and never using it. I'm not sure if I could run this race any faster. Maybe a just a tad, maybe not. It is very hard running an ultra like this with a marathon type pacing effort. Very hard, but very rewarding. After the race, Tanya & the girls took me back into Arches for some....hiking! Yes, we cruised around Balanced Rock and a few arches. It felt good to walk and the weather was simply gorgeous. I can't get enough of Moab and maximizing the day was all we wanted to do. 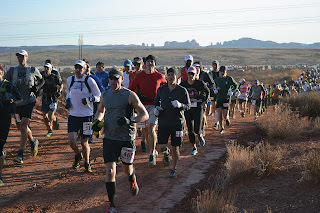 Since I didn't take many pictures during the race, here are a few from Arches. No rest for the weary. It was easy to scrounge up some energy when this awaited! This pic cracks me up. Megan holding up the South Window Arch. Now for a little perspective on how large the South Window truly is! It is probably 1000 feet behind them. It was a blast running with you over the first half. You were running strong and had a break through race. It certainly helped that the trails were dry and the weather was amazing. Look forward to seeing how the rest of the year unfolds. See you soon. Sweet, but screw that talk about never running faster. Congratulations on a solid PR. Setting an ambitious goal and hitting it must have been very satisfying. Myself, I'm good at breaking down splits and setting an ambitious goal for a race, but not as good at actually hitting those splits and achieving my goal! Todd - Maybe next year I'll be running with you in the second half. I loved watching you attack the course. GZ - valid point! I'm sure I'll be back out there gunning to crack 4:50 next time. Andy - thanks! I'm right there with you in prepping for a race. I'll keep doing that too, but I suppose this has taught me to consider taking big risks on occasion. Of course big failure is a possibility, but I'm learning that taking risks doesn't mean making bone-headed decisions. Love that pic of Megan. Perfect! Chris - We could create a nice little train out there, but I would claim the caboose. I think the barometer for my effort in a race is how many pictures I take. I could barely get in that one last Saturday. Jim - Maybe you could be my carrot at Leadville. Finally getting around to reading the report. Awesome work out there! Was so pumped for you when I saw the sub 5 time posted. Thanks Jaime. I'm already itching to get back to Moab. That's not going to jive well will kiddo soccer season starting in two weeks. You ready to rock at Salida? I was ready for Salida. Till I jacked up my calf. Taking some time off unfortunately to let the muscle recover.